In the first reading from Genesis, God is speaking to Noah and his sons at a new beginning. The flood has passed and the inhabitants of the ark have come to rest once again upon dry land. The Lord has just given the Earth and its creatures back to Noah and his family. Now the Lord announces a new and gracious covenant with creation. Never again will God send the flood to destroy creation. 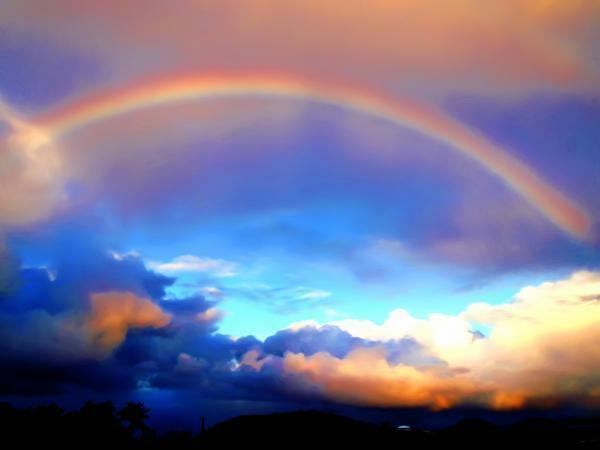 This everlasting promise is sealed by the bow which will appear in cloudy skies. The first letter to Peter is addressed to persecuted Christians. The letter compares the deliverance of Noah and his family through the flood to the deliverance that Christ accomplishes for Christians in the waters of baptism. In Christ’s suffering, death, and resurrection, there is a new beginning and the hope of salvation once and for all. The Gospel passage from Mark brings us to the beginning of Jesus’ ministry. Jesus has just been baptized by John and a voice from the heavens has declared “you are my beloved Son; with you I am well pleased” (1:11). In our passage Jesus is immediately driven into the desert. As the people of Israel endured forty years in the wilderness and testing of their faithfulness, so Jesus will remain forty days and endure testing by Satan. There among the wild beasts (associated with evil powers in the Old Testament), Jesus will demonstrate His perfect fidelity to God the Father. Mark then reports Jesus’ announcement of the Kingdom. We are told that Jesus begins after John the Baptist has been arrested. The word used in the Greek connects the arrest of John with the handing over of Jesus into the power of His enemies. Here at the beginning of the Gospel, Mark is already preparing us for the reality of the cross. The testing in the desert is only preliminary. Jesus will reveal the extent of His utter fidelity to the will of God by His words and actions in the Passion. Despite this sober reminder, Jesus’ ministry begins with joyful news: “the kingdom of God is at hand!” Jesus summons His hearers to a new beginning: to repentance and faith. This gracious possibility of a new beginning is again before us in this season of Lent.especially important in this Lent. In a world where the power of sin has is so painfully apparent, we long for renewal and new life - the chance to start again. In our longing we might recall that when Elijah looked for God on the mountain (1 Kings 19:11-13), God was not in the stormy wind or in the earthquake, but in the quiet afterwards. As we find ourselves amidst the storm, this time of Lent is a gift of silence; a time to listen in the quiet for the voice of God. With the humility to repent and the courage to believe we may indeed make a new beginning rooted in the foundations of our baptismal faith.